Since televisions became commonplace in American homes in the late 1950s, gathering around the TV in the evenings has been one of this nation’s great family pastimes. Young and old sit together watching their favorite shows, munching on snacks and sharing an hour or two of entertainment before bedtime. It may not be a scene to which everyone can relate, but for many families, it conjures up feelings of warmth and bliss. But for approximately one out of every ten families, it also conjures up memories of disputes over the volume of the television. This is because one out every ten families has such disputes, and they are usually caused by at least one of the family members struggling with hearing loss. 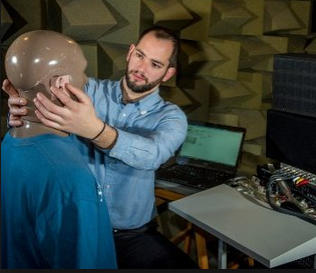 Marcos Simón, a researcher at the University of Southampton’s Institute of Sound and Vibration Research center, invented a system of loudspeaker arrays that produce a highly specific “hot spot” within a room where sound concentrates. The audio level of the sound signal boosts in this hot spot, but sounds normal elsewhere in the room. While Simón’s prototype certainly shows tremendous promise and could help to resolve disputes within many families, modern hearing aids would provide the same results more cost effectively. Plus, hearing aids are available now. If you or someone you love has to have the television at a higher volume than is comfortable to other people in your family in order to hear it clearly, that is one of the tell-tale signs of hearing loss. Modern hearing aids provide discreet, effective, dependable solutions to hearing loss, boosting only those signals that one wants to hear while filtering out unwanted noise. A comprehensive hearing exam can help to determine the extent of hearing loss and whether a hearing aid would yield appreciable benefits. To learn more about hearing loss and hearing aids, or to schedule a comprehensive hearing exam at our office, please contact Los Gatos Audiology & Hearing Aid Center today.